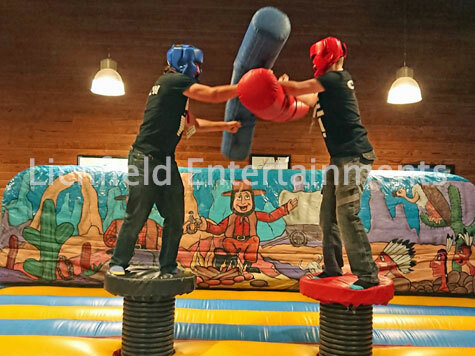 Re-create the.TV program and try and joust your opponent from their podium with our inflatable Gladiator Jousting games that we have for hire. We have three different versions of the game plus the Pole Jousting that's shown at the foot of this page. 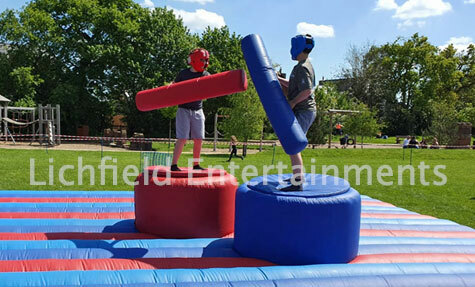 The Gladiator Duel above is suitable for both kids and adults and has firm padded podiums for the participants to stand on that are approx 18inches in diametre. This version requires an operating area of 28x25ft. 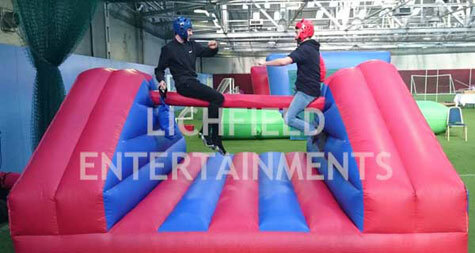 The second Gladiator Duel pictured below has large inflatable podiums that are approx 3ft in diametre and this version is suitable for participants up to approx 12 stone in weight. Although the podiums are larger because they're inflatable they can tilt if you get close to the edge adding to the challenge. This version requires an operating area of 32x32ft. The third gladiator type game pictured below is our new Rock n Roll inflatable. This game has one large podium in the middle that both the players stand on that tips in all directions. This game is an eye catching centre piece attraction for any event and is suitable for participants age 6 - adult. This version requires an operating area of 32x32ft. All three gladiator games can be operated inside or outside but if indoors you'll need a height clearance of 12ft. Pole Jousting is our other inflatable jousting game only this time the participants have to sit and balance on the bar and knock their opponent of with a pugil stick. This game needs an operating area of 18x18ft with height clearance of 11ft. Great fun for ages 8 - adult and an ideal amusement for fetes, parties, fundays, etc. If you have any queries, questions or would like to hire an inflatable Gladiator or Pole Jousting game, please click here to enquire and we will do all we can to help.